She felt unfortunate to attend the person she hated the most in these twelve years, her mother who killed her father in front of her eyes with a knife and abandoned her to live in an orphanage but as a doctor she wasn't allowed to refuse to treat anybody because of personal reasons. She met the head of orphanage outside the room where her mother was kept under observation who held her hands and said,"My child, I know you never wanted to meet her but fate has brought that day and a chance for me to tell you about the person who saved you from being raped by your father by killing him and supported your studies by working from jail premises." "Today, at this stage when she was at verge of death , I thought it was necessary for you to know that she used to take care of all the matters related to you even in jail." She shouted "MOM" as she entered the room and hugged her with teary eyes,the response of which her mother gave with a smile so soothing to satisfy her soul that no burden was left on her soul which thought that it's the right time to bid adieu to the world. She cried inconsolably for the maker of her life-the master of her all matters her mom. 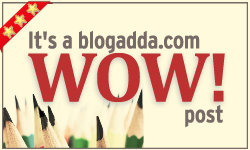 that was beautifully written...nice post :) all the best for the wow! Often, we do not know the complete truth. We react to somebody or something based on partial information. Luckily, in this story, the daughter got to know the complete truth when her mother was alive. Beautifully written. I loved the emotional weave. Ah! Only moms are capable of doing this .. Such a beautiful story. Only a mother would ever make such a sacrifice.